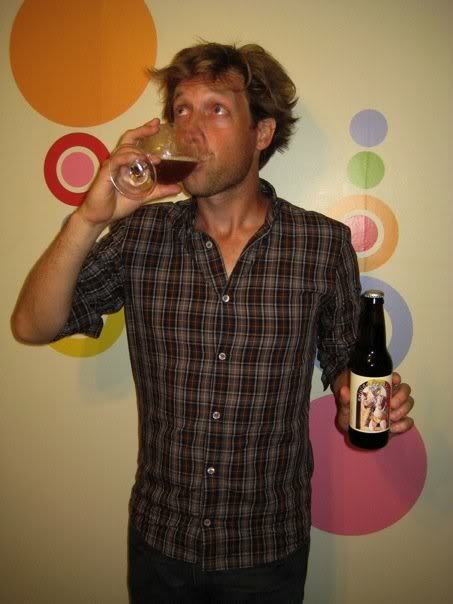 James Kennedy » Belgian Prankster Beer! Ichthala Mask! Belgian Prankster Beer! Ichthala Mask! I received two INCREDIBLE examples of Order of Odd-Fish-inspired art this week. I defy any author to top them! On the left? Belgian Prankster beer. On the right? 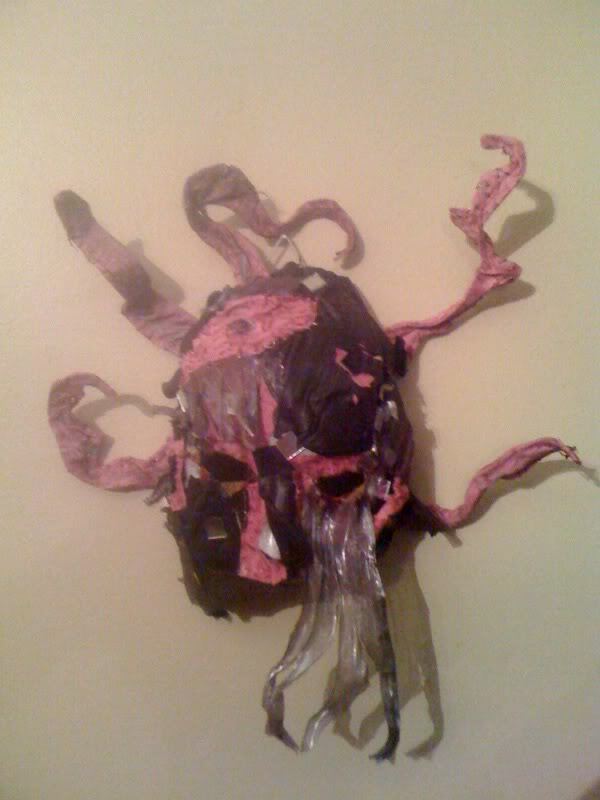 A mask of Ichthala, the All-Devouring Mother. I may not have many fans, but my fans have style. 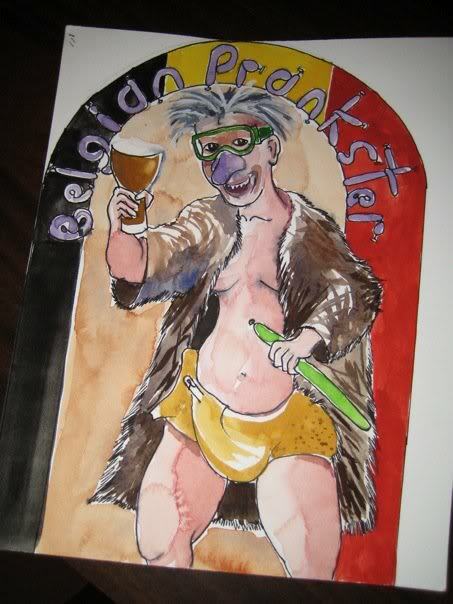 The Belgian Prankster beer first. It was brewed by husband-and-wife team Matt Mayes and Meg Rutledge. The gorgeous label was drawn by Gabe Patti. I first met Matt and Meg when they came to an Odd-Fish reading at the Hopleaf—and we hit it off splendidly—and that’s when they told me their plan to brew a Belgian Prankster beer! A crazy Belgian pale ale (think Belgian + American IPA). 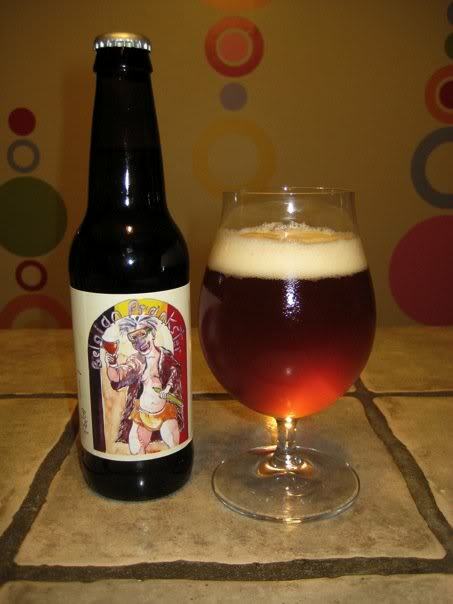 Piloncillo sugar gives a nice hat tip to our Latino neighborhood, and helps balance out the generous amount of hops . . . 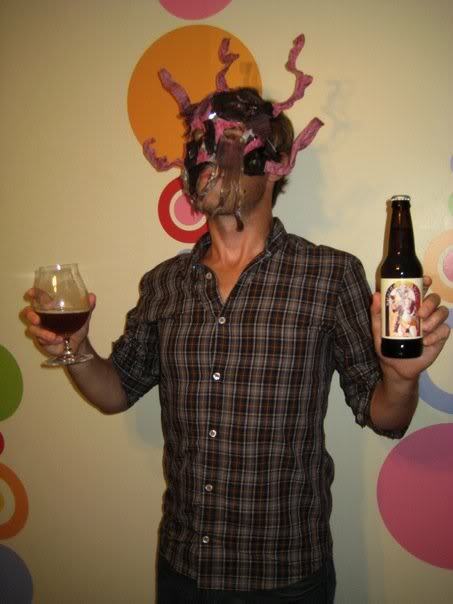 This beer is not for the faint of heart—much like the Prankster! It’s strong with lots of hop-bite, which will mellow over time. Meg and I were buzzed after sharing a bottle . . . We infused the grains while Brilliant Pebbles was on the stereo, and then placed a copy of Odd-Fish on top of them while they soaked for an hour, trying our best to capture the essence of the Prankster via osmosis. (We really needed some chanting in there too.) Later in the day, we had our first boil-over ever, foam and hops everywhere—definitely something the Prankster would do. In spite of the mess, we were quite pleased. Next up: the Ichthala mask! I first met Caitlin, the creator of the mask, when she wrote me an email asking if she could read the audiobook of The Order of Odd-Fish. As it happened, I’d already sold the rights to Audible.com (and as it turned out, Jessica Almasy’s reading of the audiobook was stellar). Anyway, I responded, and we struck up a friendship. It turns out that Caitlin makes and sells masks, and so naturally I wanted an Odd-Fish mask. Little did I know the awesomeness that she would unleash! That’s Caitlin, and I’m wearing the mask. The tentacles are posable, and the various bits of fabric are held together with multicolored thread, just like how the Silent Sisters stitched together the Ichthala. It was so glorious I wore it for the Brilliant Pebbles show at the Green Music Festival, but my bouncing caused the mask to slip over my eyes in the middle of a song—I had to play the rest without being able to see my fretboard—I barely succeeded. Anyway, Caitlin was in town for Vividcon. I’m ashamed to admit I’d never heard of the practice of vidding before—that is, making underground videos by cobbling together the clips of various shows to make a whole new work. For instance, one fan of the rebooted Battlestar Galactica series, who didn’t like the way the final 10 episodes of the series played out, cut-and-pasted snippets of various episodes and put them in an order such that he generated his own, preferred ending to the series. I’ll be sure to watch it as soon as I’m done watching the series (Heather and I are on Season 3 now). Hilarious! And so not only have I received a gorgeous Ichthala mask, but my horizons have been broadened. Thanks, Caitlin! And thanks, Matt and Meg and Gabe! I’m thrilled, honored, and kind of intimidated at your talent.